It was a huge privilege and pleasure to give one of The School of Life’s Sunday Sermons at London’s historic Conway Hall recently. Last time I’d been there was to discuss the power of vulnerability with emotions researcher Brené Brown. 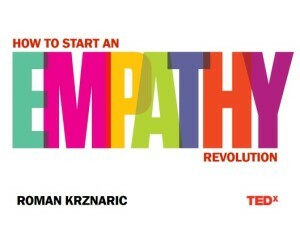 This time I was there to talk about my new book Empathy, but that was just part of it. The 500-strong congregation stood at the beginning and end to sing two great empathy-related songs: Stevie Wonder’s Living for the City and Nina Simone’s Feeling Good. There were even little shoe-shaped biscuits from Biscuiteers. Here’s the video from the Sermon in full, where I talk about the six habits of highly empathic people and how to make them part of your everyday life. Paul Tibbets, the man who dropped the atomic bomb on Hiroshima on August 6, 1945. Should you empathise with your father's killer? Jo Berry (right) standing next to Pat Magee, the man who killed her father. One of the greatest challenges of leading an empathetic life is trying to step into the shoes of people who we consider to be ‘enemies’ or whose views and values are very different from our own. If you’re on the receiving end of a racist comment from someone at the pub or a torrent of unfair verbal abuse from your boss, the idea of trying to empathise with them would probably be the last thing on your mind. If you came face to face with the person who had recently burgled your house, could you overcome your anger to see the crime from their perspective, and understand the circumstances that may have driven them to it?